I’ve had a month off from blogging while life got crazy, but my wells are all filled and I’m ready to start waffling on again! 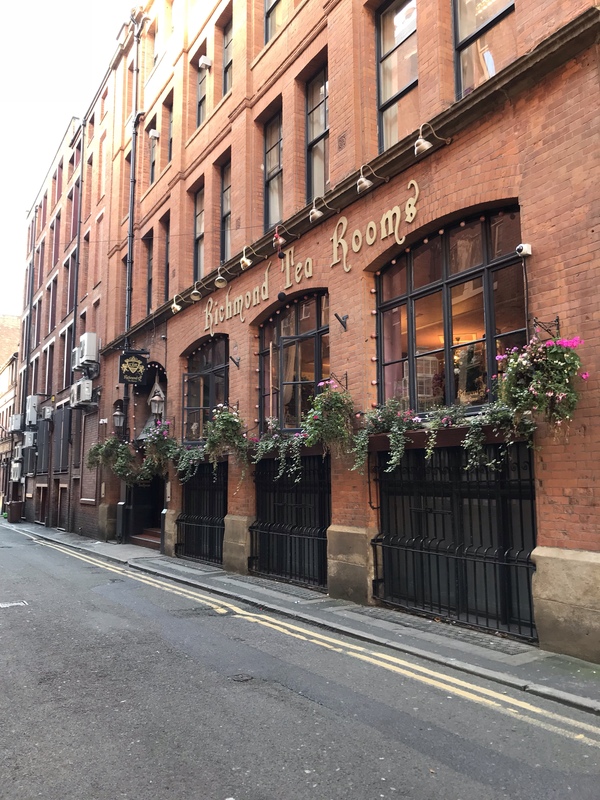 We’re currently in Manchester visiting family on the kid’s half term break from school and my Mum has booked us Afternoon Tea at a gorgeous new Tea Room she’d found. This was an unexpected delight on our first day down in Manchester. After checking out the website I was personally very excited, being a huge Alice in Wonderland fan, but then genuinely quite panicky. I have 3 noisy boys and this place looked a little fancy! We very rarely eat out and when we do it’s usually family friendly places not quaint little tea rooms. They had a children’s menu on the website and I figured if we trashed the place we won’t be going back any time soon so why not?! The sheer novelty of Loki’s first ever time seeing and riding in a train kept us amused on the way and we got in and seated immediately. We were in a little sectioned off area with a beautiful canopy and in front of one of the gorgeous windows. It was amazing. I took lots of pictures but I feel I could have taken a million more – so we’ll definitely have to go back! The whole tea room was stunning. Little treasures to be found in every nook and cranny. Even spotted a flamingo! Day. Made. Tea cups and saucers littered the table. Alice in Wonderland themed trinkets filled the walls and were printed on the cushions. Nothing matched, which I love! It was beautiful. The boys were fairly impressed too and for the older two it was definitely a win! We all had a variety of afternoon teas, with wee sandwiches, massive scones that were still warm and I had a Queen’s tea which meant I got an extra plate full of cakes… mmm! I ended up sharing my cakes with Mark because I was fit to burst and the boys demolished everything in sight. Our fresh loose leaf teas were so fragrant and delicious too and the choices were incredible! So many options to choose from. I think every trip down to Manchester now we’ll be visiting here, it could be an annual treat! We even found time to play with some Nins while we waited in between mouthfuls! If you’re up for a little indulgence then I can highly recommend visiting Richmond Tea Rooms. It’s a short walk from the train station and was lovely and welcoming, child friendly and lots of fun. How fun! Happy sipping or slurping and of course feasting!